Today was the last day off of a long weekend. I have several straight days of work ahead so I wanted to see if I could gather some more food for the next few days. 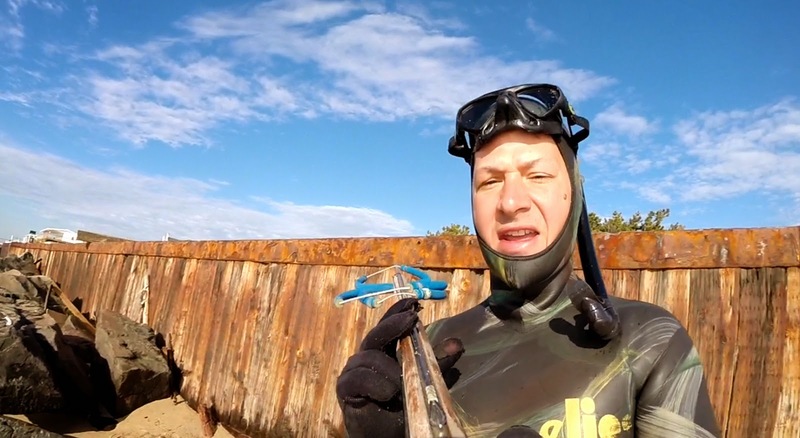 I met up with my new friend, Dave and we made an attempt at the first spearfishing of the year. the ocean temperatures have reached an acceptable level and the water was relatively calm. Time to jump in. We started at 6:30am and headed to Deal. There are several rock jetties in Deal that usually have fish around them. I had read some fishing reports the night before talking about several 50 pound striped bass that have been caught in the area. Boy would that be nice to see. Filled with delusions of grandeur, my expectations were set way too high. Unfortunately, when we got to the water it was so cloudy that I could not even clearly see my hand in front of my face. I made several attempts to go to the bottom to see if the visibility was any better but it wasn't. In fact, I didn't even know I was at the bottom until the tip of my speargun hit the sand. Never saw it. This is the worst possible situation to come across while trying to spearfish. It takes a lot of energy and preparation just to get into the water and when the conditions are this bad it makes me miserable. We packed it up and left - disgruntled. At home I was faced with the task of cleaning and drying my wetsuit and equipment - not to mention all of the SAND! I hate sand. It was everywhere - despite all of my efforts to keep things clean. I also spent a good part of my day working on a new design for a diving board/float that I plan to use on my next dive. In the afternoon I finally made time to cook all of this fluke I have been accumulating. I have way too much to keep refrigerated so my plan was to bread and fry a mass amount of fish and then freeze it for later. It took a couple hours but I think it was well worth the effort. This is my favorite way to eat fluke and although the breading and frying is not part of the Survivor Diet, I will have several bags of ready-to-eat fish for after the diet. This is where the Foodsaver vacuum sealer comes in handy. I don't really like to freeze fish for any extended period of time but when you have this much, the vacuum bags are the answer. These pieces will stay very fresh for about a month. After that, the quality starts to go down a little. I prefer cooking the fish first instead of freezing it raw and then cooking it. I think this makes a big difference. When I go out fishing I can now take a bag of fillets out of the freezer and bring it on the boat. It is an easy lunch. Once it defrosts you can just open the bag and eat. It's best on a sandwich though. I remember that from last year - The Best Sandwich Ever. You're going to have to look that one up if you're interested enough. Finally, at the end of this very long weekend, we made a nice fire outside in the pit and I made a batch of smoked bluefish out on the smoker grill. It should be ready for tomorrow. While we were spending a lot of time in the backyard I made an attempt at another primitive fire. Fail, fail and more fail. I got lots of smoke but I just could not get an ember to ignite. I was so exhausted after this day - after this week! Back to work tomorrow - and once again I will be working on Wednesday so I will have to prepare enough food to last the week.